Frequently Asked Questions | Employee Gifts from gThankYou! Have a Question About our Gift Certificates? How do gThankYou Gift Certificates Work? gThankYou Gift Certificates work as Manufacturer Coupons good for any brand of merchandise specified and redeemable at virtually all traditional grocery chain stores in the U.S. that honor Manufacturer Coupons. They have no cash value and cannot be redeemed for any other items. How do I add recipient names to the Certificates? When you order online, you will be able to enter recipient names for small orders. For larger orders, email an excel spreadsheet with names (first name, last name) to: [email protected]. Call 888-484-1658 with any questions. How do I order my free Enclosure Cards? When you order online, you will be asked if you would like the free Enclosure Cards – select “Yes”! Once your order is complete, we immediately send you an email with the links to order your free card. Just select the design you want, add your personal message and upload a logo if you would like it included on your Cards. If you select to customize a card, we send you a proof to approve! How do I find the Enclosure Card Designs? All Enclosure Card designs can be found from the “Free Enclosure Card” page listed under GIVERS in the top navigation. On that page you will find PDF Design Catalogs of our most popular designs for Autumn & Thanksgiving and Christmas and Winter Holidays as well as the opportunity to view designs by season or occasion. Do you have Spanish Language Materials? 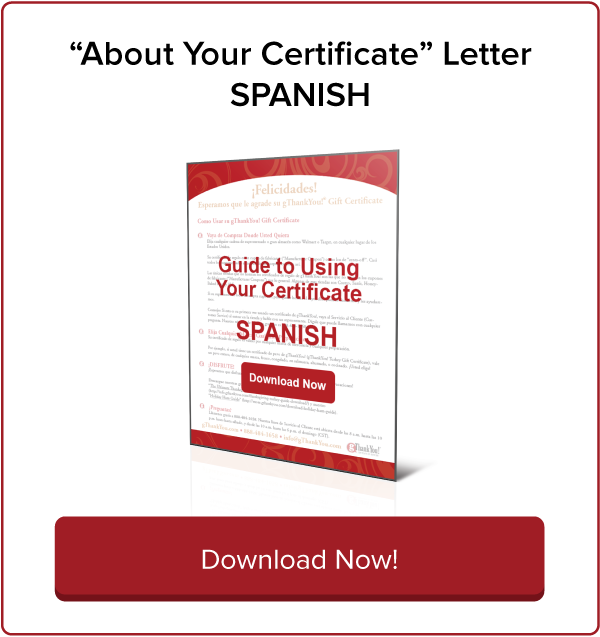 Yes, you can download information about gThankYou Gift Certificates in Spanish here. During the holiday season, we have Spanish language customer service assistance during business hours. What’s the difference between a Turkey Gift Certificate, Gift Card or Gift Check? gThankYou! 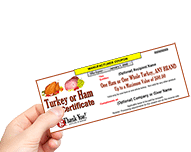 Turkey Gift Certificates are Manufacturer Coupons which are only good for a whole turkey (any brand) and redeemable in virtually any grocery chain store in the U.S. They have no residual value and cannot be used to buy any other merchandise. Gift cards allow recipients to buy any store merchandise. Butterball® Gift Checks and others can be deposited in a bank account or used to buy any merchandise. Where can I redeem my Gift Certificate? You can redeem your Certificate at major U.S. grocery stores that honors Manufacturer Coupons. Who doesn't honor gThankYou Gift Certificates? The only stores that do not honor gThankYou Gift Certificates are those that do not honor any Manufacturer Coupons such as the Club stores Sam's and Costco, specialty stores such as HoneyBaked Ham, and the Aldi chain. We do not recommend redeeming gThankYou Coupons at discount general merchandise stores such as Walmart and Target. What if the store does not want to accept the Certificate? If the store you choose normally honors Manufacturer Coupons and has any questions or concerns, please ask the cashier or customer service to call us so we can take care of it for you. Our toll-free number 888-484-1658 is printed on all Certificates. May I spend more than the amount of the Certificate? Yes, just pay the extra amount at the cash register. What if I spend less than the amount of my Certificate? You receive the gift of the food given such as the turkey or ham and do not receive change. It works just like any other Manufacturer Coupon. Can I use the Gift Certificate to buy something else? No. gThankYou Gift Certificates are only good for the merchandise described. May I shop in a different State? Yes! You can use your Certificate anywhere in the U.S. including Alaska and Hawaii. May I give my Certificate to someone else? Yes, you are able to donate or give your Certificate to someone else if you wish. Our customer service line is open from 8 a.m. to 10 p.m. Monday through Saturday and 9 a.m. to 7 p.m. on Sundays (Central Time). Hours are longer during the holidays. You can reach us toll-free at: 888-484-1658. Spanish Language Customer Service is available during the holiday season (October – December). Para obtener más información sobre los certificados de gThankYou y descargar una referencia gratuita en español - haga clic aquí.